NEW! !> 1.) 6DPUC/CK - Combo/Key Pop-Up <NEW!! 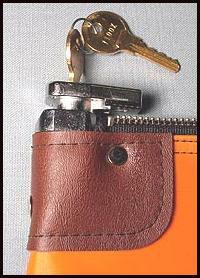 We have three different lock systems incorporated in our deposit/high security bags. While NO BAG is theft proof, these bags offer a much higher degree of security because of the locking system and basic construction of the bags. While they offer a much greater degree of security, there are some differences that should be considered in choosing which lock system would best fit your needs. The very first thing to be considered is the size of item (s ) you intend to put inside the bag. Regardless of style bag locking or not, you want to make sure that the bag size will accommodate the item (s) you are going to place inside. After that, you should consider who will have or should have access to the keys. Questions relative to key concerns are: Do you want separate keys for each and every bag, or do you want them keyed alike (all keys identical)? 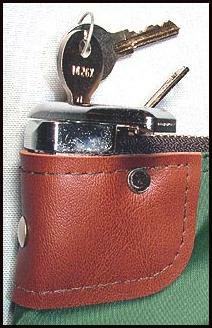 You can also have the bags random keyed, keyed to a master key which would open all bags. You SHOULD also consider your present and more importantly your future needs which may expand or change. Some bags NEED a key in order to lock the bag while others do not require a key to secure the bag. This by far is generally the most determining factor in choosing the correct system to meet your needs. Please understand that bags are NOT safes no matter who manufactures them!!!. They offer an additional measure of security and accountability in the handling and transportation of currency, documents, and the various items that one may place inside. The one style locking system that requires the key in order to lock the bag is the 7PPU wherein the 6DSL and the 6DPU do not require the key in order to lock and secure the bag. While none of the these systems would be easy to penetrate, the 7PPU offers a slight advantage and most integrity regarding the lock itself although this really should not be a point on contention. If someone is skilled enough to pick a six pin lock, a seven pin lock would not present a giant hurdle either! 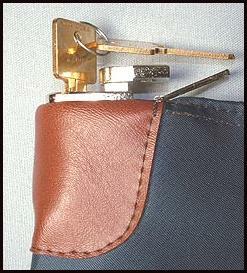 When the bag is zipped closed and locked, it is the lock head that actually holds down the slider which does not allow the slider to move backwards thus locking the bag closed. The slider body is seated in a metal cradle when locked. 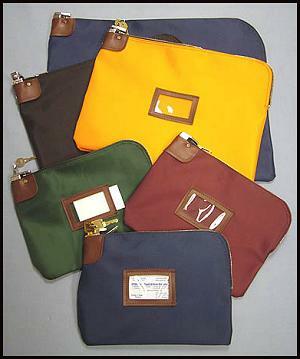 These bags are can be made in various fabrics, colors and sizes. The four stock sizes are: 10"w x 7"h - 10-1/2"w 9"h - 12"w x 9"h - 16"w x 12"h. We can also incorporate any of these systems into a custom size bag if your operation required this. Please contact us with any custom or specific needs which may not be served by our stock line. 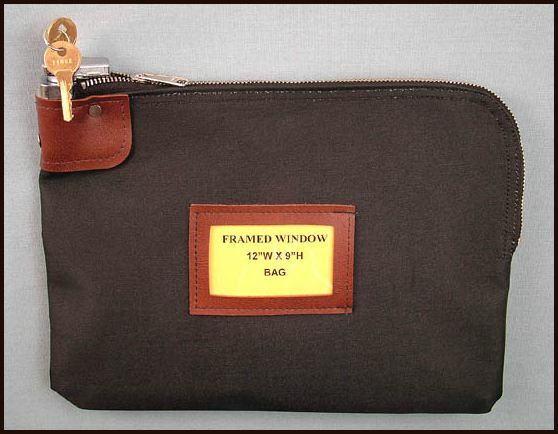 If you need larger bags for transporting and storing larger items such as documents, manuals, folders, etc. please click on the link provided> HERE< and that will take you directly to that page and information.